Automatically create & control A2billing pre-paid accounts and offer refill packages. 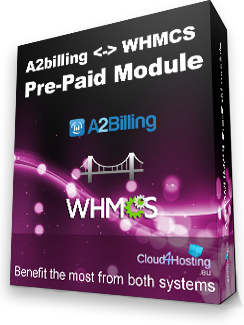 A2billing WHMCS Pre-paid module allows your clients to sign up for a pre-paid account on a2billing voip billing system and instantly send SIP account access details using WHMCS mailer. Adding funds to A2billing account via WHMCS is easy, simply add a new product in WHMCS & set package price. On order funds will be added to A2billing account instantly. 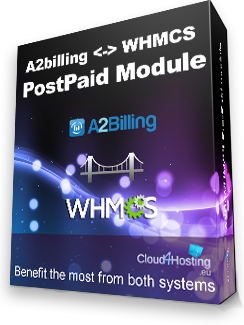 A2billing WHMCS Post-paid module allows you to offer SIP subscriptions on a2billing, And charge fixed monthly fees and or setup fees for each extension.